The festival opens with a lecture by Elif Rongen of the EYE Filmmuseum. She talks about the origins of silent film, from the first screenings until the glory years. Hosts Daan van den Hurk and David Robinson present the film of the night: FAUST (1926) by F.W. Murnau, which is preceded by PARANORA (2014) by Anne-Maartje Lemereis. Saturday afternoon is called the Avant-Garde Afternoon, with several short silent films: OCEAAN (2017), PHYSIQUE DIABOLIC (1912), GRANDES EAUX DES VERSAILLES (1902), DAS TÖNENDE HANDSCHRIFT (1929), KRI KRI FUMA L’OPPIO (1913), DIEPTE (1933) and ONTLUIKENDE BLOEMEN (1928-1932). David Robinson gives a lecture about Charlie Chaplin and Buster Keaton and their days in the theatre and their Vaudeville days. After that, it’s time for Elif’s choice: FILIBUS (1915), which is preceded by FLORA (2016). 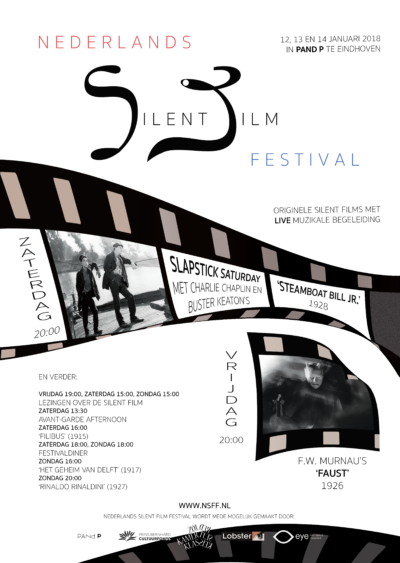 Hosts Daan van den Hurk and David Robinson present the highlight of the festival, Slapstick Saturday, starting with Charlie Chaplin’s EASY STREET (1917), followed by two Buster Keatons films: COPS (1922) and STEAMBOAT BILL JR. (1928). Daan van den Hurk starts off the Sunday with a lecture about the musical accompaniment of film, and gives the audience a chance to try it for themselves. After that, three hidden treasures are shown: VOGALA (2016), EINDHOVEN (1920) and HET GEHEIM VAN DELFT (1917) by Maurits H. Binger. The closing film of the festival is the adventure film RINALDO RINALDINI (1927), preceded by RUE DU CANAL (2018). NSFF 2018 was made possible by EYE Filmmuseum, Prins Bernhard Cultuurfonds, Lobster, Pand P and Zolderkamertjesklassiek.